Wesley's Trading Post has taken over the lapidary and prospecting department as Kay retired to care for her Mom. Wes and Patty Bullock long time residents and professional business folks here in Newport have been members of the Greater Newport Chamber of commerce for many years. They have owned Wesley's Trading Post for the last 5 years and adding the lapidary division to their gunsmithing inventory was just a natural transition. 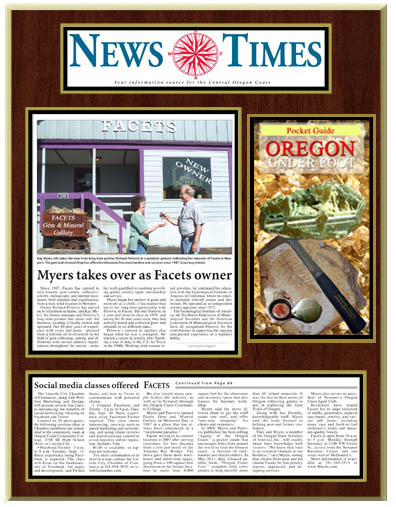 For 26 years - since 1987 FACETS had catered to amateur and experienced rock hounds, gem cutters, collectors, jewelry craftsmen and interior decorators. Kay the face of FACETS since 1987 had taken charge with over 30+ years of experience that has been gleaned from a lifetime of involvement in the field of gem collecting, finishing and jewelry fabrication. Myers is still affiliated with various industry organizations through out the nation as her interest began early as a youngster. In 1979 she met her ex-partner in a gem & mineral class. During this 30 year partnership they had actively mined and collected gems and minerals in six different states as hobbyist. August 2011...Richard a Gemologist (retired). Grumpy Bear had left the building and FACETS once again became known Lincoln county's knowledgeable, friendly, locally owned and operated jewelry and lapidary supply house with a wonderful, knowledgeable staff. Stressing the importance of both quality in merchandise as well as customer service, was their main priority. As members of the Oregon State, Jewelers of America, Inc. trust was always an essential element in their business and FACETS clients returned for FACETS jewelry repair services from distant homes of Hawaii as well as throughout the mainland! FACETS moved its headquarters in 2007 to the Grove St location in Newport, where their lapidary workshop was operational on site. Kay has retired to care for her Mother Esther that many of you may have had the pleasure of meeting at the shop daily over the past 26+ years. Esther was diagnosised in late 2012 with early dimentia so now Kay is caring for her Mom at this time and Esther is doing very well, Thank you. This transition leaves Kay the time to oversee the liquidation of the remaining inventory on line. There will be many additions to the website as time permits. Kay is still actively marketing the Oregon pocket guides that she produced and also invisions that there might possibly be two more pocket guides in her future yet to be written. All images Copyright © of their respectful owners. All Rights Reserved.